Successfully Added Huawei Honor 5X Android Smartphone - 5.5-Inch IPS Display, Dual-IMEI, 4G, 2GB RAM, Octa-Core CPU, 1080P, 13MP Camera to your Shopping Cart. Meet the Huawei Honor 5X, a remarkably sleek and powerful smartphone that has been manufactured by one of China’s most respected smartphone companies. Thanks to its stylish and ultra-thin design, this Chinese smartphone features the looks of a true high-end device. Within its beautiful body lays a stunning 5.5-Inch IPS display that portraits all media in stunning detail and vivid color – allowing you to enjoy a Full-HD cinematic experience from the palm of your hand. Whether you like to watch the latest movies, enjoy the most demanding games, or simply take advantage of the newest smartphone Applications, the Huawei Honor 5X is guaranteed to meet your demands by providing you with an absolutely stunning visual experience. With its two SIM card slots, this Chinese smartphone allows you to insert two SIMS at once. 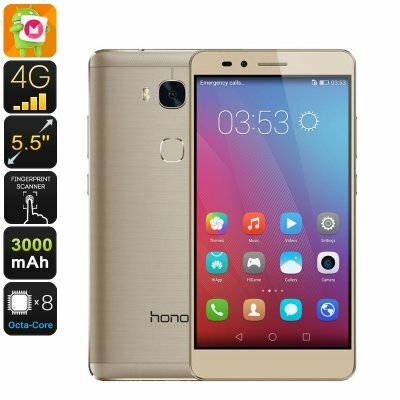 Added to that, the Honor 5X also features dual-IMEI numbers thanks to which you will now be reachable on two phone number simultaneously while using merely one device. 4G connectivity further enhances your overall mobile connectivity, providing you with the fastest data speeds out there. No matter where you’ll be at – with this sleek Android phone in your pocket you’ll always be able to engage in online phone calls, browse the web, and stream online movies at lightning speeds. Along with its 3000mAh battery, the Huawei Honor 5X is capable of providing you with up to 5 hours of continuous usage time – enough to get through the most demanding of days without needing to worry about battery life. Packing an Octa-Core CPU that has been clocked at 1.5GHz; this Android smartphone is efficiently capable of handling mobile games, movies, and applications without dropping a frame. To increase your user experience even further, this Android phone furthermore packs the Adreno 405 graphic’s unit that supports graphically intensive gameplay – allowing you to take the absolute most out of your mobile entertainment experience. With 16GB of internal storage and 128GB of external memory support – the Huawei Honor 5X always has some storage left available for you to save your favorite games and media alike. At the rear of this high-end Chinese smartphone, you’ll be able to find a stunning 13MP camera that snaps mesmerizing pictures and video alike. Whether you’re enjoying a simple night out with your friends or are experiencing a beautiful view during one of your upcoming holidays – with the Huawei Honor 5X in your pocket not a single special moment in life passes by uncaptured. With its 13MP camera, this Chinese smartphone lets you capture, share, and recall memories like never before. The Huawei Honor 5X comes with a 12 months warranty, brought to you by the leader in electronic devices as well as wholesale electronic gadgets..
Arabic: - 5-بوصة الروبوت الذكي - Chinese Simplified: - 5 英寸的 Android 智能手机 - Czech: - 5, 5palcový Smartphone se systémem Android - Dutch: - 5-inch Android-Smartphone - French: - 5 pouces Android Smartphone - German: - 5-Zoll-Android-Smartphone - Hebrew: - הטלפון החכם אנדרואיד 5 אינץ - Hindi: - 5 इंच एंड्रॉयड स्मार्टफोन - Hungarian: - 5 hüvelykes Android okostelefon - Italian: - Smartphone Android da 5 pollici - Japanese: - 5 インチのアンドロイド スマート フォン - Korean: - 5 인치 안 드 로이드 스마트폰 - Malay: - Telefon pintar Android 5-inci - Norwegian Bokmål: - 5-tommers Android Smartphone - Romanian: - 5-inch Android Smartphone - Russian: - 5-дюймовый Android смартфон - Spanish: - Smartphone Android 5 pulgadas - Thai: - สมาร์ทโฟน 5 นิ้ว - Turkish: - 5-inç Android Smartphone - Vietnamese: - 5-Inch Android Smartphone.